I bought my waffle iron a year ago for Mother’s Day and never thought that I would be using it as often as I do now. I told my husband that it’s going to lie around untouched, collecting dust. But boy was I wrong! 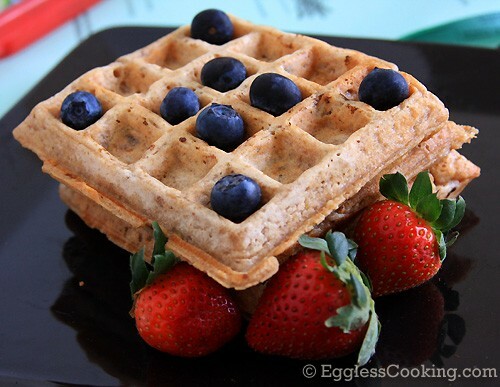 My eldest son has become a waffle fan and he wants me to make waffles every weekend. I have made it so often that I know the recipe by heart. So each week I try to give it a different touch by coming up with a variety of combinations. 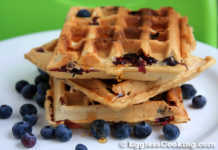 This oatmeal raisin waffle recipe is one of my favorite. If you are a fan of the classic oatmeal raisin cookies, then this waffle will become your favorite as well. 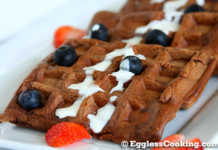 Make any day a special day with these comforting vegan oatmeal raisin waffles. In another medium size bowl combine together the wet ingredients and let it stand for a couple of minutes. Pour the wet ingredients into the dry mix and mix well. Let the batter stand for at least 10 minutes before preparing the waffles. Grease the waffle iron with non-stick cooking spray and prepare the waffles as per the manufacture’s instructions of your iron. 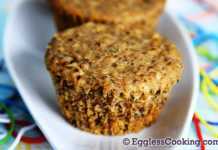 Does Whole Wheat flour means Atta flour? Yes, most of the times. Look for the words “whole wheat flour” on the pack. Most of the Indian brands use that phrase these days. They look gorgeous! Must be tasting awesome too.